Eton mess is a wonderful celebration of crumbled crisp meringue, cream, raspberry sauce, berries. This recipe also includes spicy biscuits shards which will make this dessert tempting to all. Preheat oven on CircoTherm® to 100⁰C and line the universal tray with baking paper. Place the 3 egg whites into a bowl of an electric mixer and whisk until soft peaks form. Slowly add the 250 g of caster sugar and lemon zest, and continue to beat until stiff peaks form. Put meringue into a piping bag with a 1 m nozzle and pipe into different shapes, no higher than 1 cm on the prepared tray. Place meringues in the oven and bake for 45 minutes or until meringues are crisp. Place frozen raspberries into a medium saucepan with remaining sugar and heat on level 6 Induction until the sugar dissolves and the raspberries are soft. Puree with a stick blender and then pass through a strainer to remove the seeds. Put into a piping bag and refrigerate until required. Place the cream and 50 g of caster sugar into a bowl of a mixer and whip until a stiff peak. Put into a piping bag and refrigerate until required. Preheat oven on Top and Bottom heat to 130⁰C and line the universal tray with baking paper. Place 2 egg whites into a bowl of an electric mixer and beat until a medium peak. Add in the sugar and beat for 1 minutes. With a wire whisk, add the flour, melted butter and spices. Pour the mixture onto a prepared tray and spread thinly. Bake for 30 minutes or until golden in the centre. Let cool and then break into small shards. Store in an airtight container. 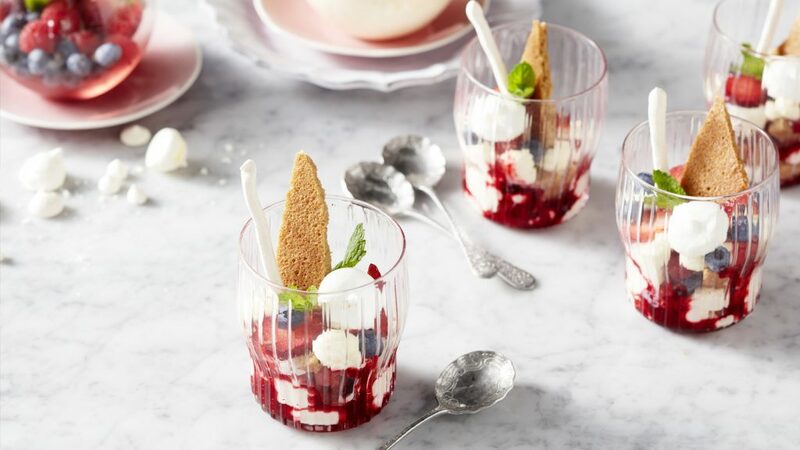 In individual glasses or jars, layer the crushed meringues, broken biscuit, cream, raspberry sauce, berries and mint. Finish desserts with a shard of spice biscuit. The meringues, spicy biscuits and raspberry sauce can be made up to 1 week in advance. Keep the meringues and biscuits in an airtight container and the sauce in the refrigerator.